Kilmarnock manager Allan Johnston has challenged his side to show the character needed to avoid the Premiership's relegation play-off spot. 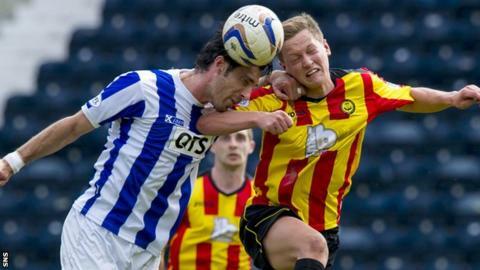 The Rugby Park men are just two points clear of 11th place after losing 2-1 at home to Partick Thistle. "It's a test of character now, we're in a dogfight and we need to make sure we have the mentality to go and win the next four games," said Johnston. "There's a lot of massive games coming up now - you can see how tight it is." Vitalijs Maksimenko gave Killie the lead, but Kallum Higginbotham replied and Aaron Taylor-Sinclair scored late on to win it for Thistle. But Johnston believes his side were unlucky not to be awarded a goal when a Michael Gardyne effort hit the bar and bounced out. "We didn't look as though we were going to lose the game. Michael Gardyne hits the bar and it looks as though it's crossed the line, so it's a big decision for the linesman to call," he said. "I've had a quick look at the video and it looks as though it has crossed the line, but it's tight to be fair. "The referee said he couldn't see it, he couldn't give the decision, so he's relying on his linesman. It just shows how fine a margin it is. "We looked really comfortable at 1-0, playing good football, but they've scored the goal a couple of minutes after ours and that's happened numerous times this year. "We've just got to be a bit stronger and we can't afford to lose a goal at that stage of the game. "The goal gives them a lift, but even then we were still in the game and their keeper has pulled off a fantastic save right at the end to deny Ross Barbour. "But we now need to make sure we're all together, make sure we get a couple of wins and make sure we're nowhere near this play-off."